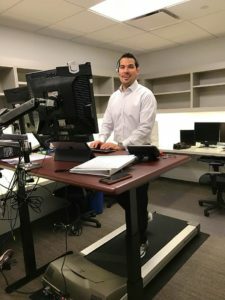 Lawyers spend a lot of time at their desks and many of them have transitioned to desks they can sit, stand, or walk at to help keep their fitness level up, their brain active, and their law firms humming along. Sitting and being sedintary for long periods of time has been shown to reduce motabilosm, blood flow, and mood. By standing from time to time, walking from time to time, and taking a healthier look at our time at work we can all greatly improve how we feel and how our bodies work at work. 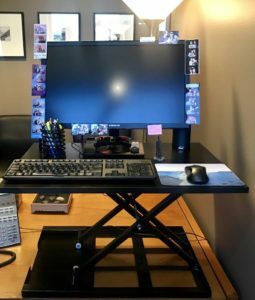 Here are some great examples of standing desks used by lawyers all across the USA and quotes on what they love about their desks. "We are a team of 11 women working closely together to assist all our clients in the best possible manner. We have been using a standing desk for the last year and a half and loving it! it helps with back problems, tiredness and even makes us feel more active due to not been sitting all day long." Karen Weinstock, came to the U.S. with two suitcases and a dream, facing many obstacles relocating to the U.S. Karen founded the firm because she believes that there are better and easier ways to bring immigrants into the U.S.
"I built a standing desk a few years ago and absolutely love having the ability to stand up most of the time, and only sit when I need to. It's especially helpful when I'm working on a court filing or mailing that has to have documents printed, signed, edited, reprinted, etc. Rather than having to get up and down from a chair, it's so much easier to just walk around my office. I'm looking forward to upgrading my DIY model to a professional, motorized version within the next year or two." Andrew helps small business owners create and protect successful companies. As a tech nerd with a law license, Andrew also works as a technology consultant for PaperlessChase. "As lawyers and legal professionals, we live at our desks. The problem, of course, is that being chained to your desk can be rough on the body -- and stifle creativity. Before the treadmill desk, members of our team would take "walking meetings," where we would walk and talk. In doing this, we discovered something surprising: we were happier, we had clearer thoughts, and we tended to come up with our most creative ideas while walking. We wished we could have that level of productivity and health all day... With the treadmill desk, now we can." "We outfitted it with dual monitors, a phone headset and room for iPads and laptops. 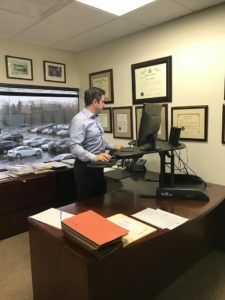 Contrary to our concerns, we've found that we are actually more productive on the treadmill desk"
Lamber Goodnow provides personal injury legal services in the Phoenix area and has been covered by CNN, Fox, WSJ, and the NYT. Visit Lamber Goodnow to learn more. "I started using it because I have severe arthritis and back issues and working while standing as opposed to sitting has really helped. 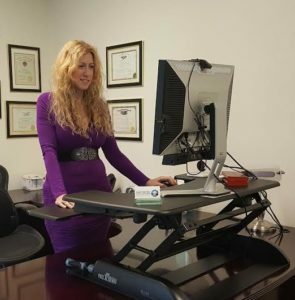 There is a lot of medical evidence that use of standing desks improves your health and actually helps to burn calories and reduces your risk of certain conditions such as hypertension. I actually find that it also helps to improve concentration and the elevation above your desk gives you more surface area on the desk itself." Mandelbaum Salsburg is a full service law firm and has been ranked by U.S. News & World Report as a “Best Law Firm” for the eighth year in a row and a number of attorneys are listed in both Best Lawyers in America© and New Jersey Super Lawyers©. "The desk enhances my productivity by preventing distractions and helping me focus. Whereas with a traditional desk, if I felt uncomfortable, I was stuck in that position, now I can change my position with ease in just a few seconds. Once my position changes, it's easier for me to focus on the task at hand." 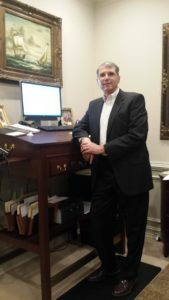 "My only complaint about the X-Elite is it isn't large enough to accommodate two monitors..."
The Snell Law Firm is built on a model of direct access to experienced and aggressive attorneys. With diverse strengths in many areas of the law, our accomplished legal team provides solid counsel and fierce courtroom representation for a wide range of legal issues. 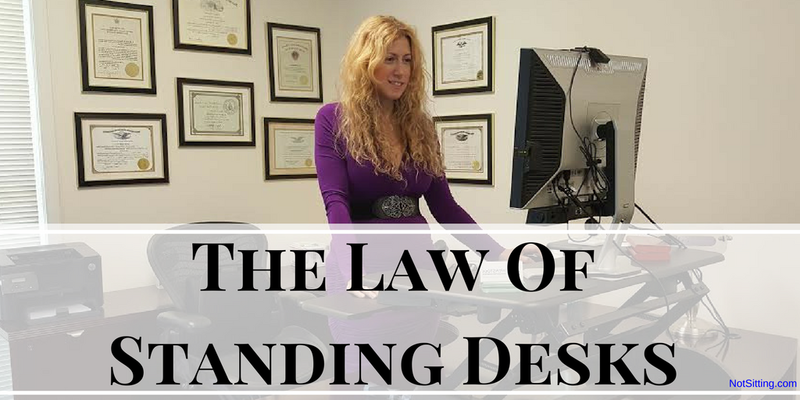 "I used a traditional desk for my first 15 years of practice, and due to the sedentary nature of the practice of law, ended up gaining 40 pounds. 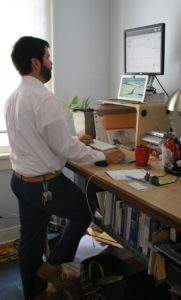 In my quest to regain optimal health, I did some research into standup desks about ten years ago and found that Donald Rumsfeld, former US Secretary of State, used a standup desk, as did Thomas Jefferson before him." "I lost the 40 pounds using a combination of tennis, smart food choices, and the use of the standup desk." Robinette Legal Group provides personal injury law representation and is ranked in the top 1% of lawyers by the Litigator Awards. We find great satisfaction in helping our clients resolve their legal issues and seeing how their lives are going to improve after their successful result. We have met some of the kindest people in West Virginia from every walk of life and have made many lifelong friends through the work we do. To get help choosing a standing desk that is right for you, call us at the number above or click the chat button. Jeff is really good at helping you find a solution that works for your needs and budget.